General Characteristics: Tall, erect, stocky, maturing within 9 to 12 months, producing from 2 to 5 oha; identified by tall, upright, dark green petioles with distinct blackish edges, and horizontal leaf blades. Petiole: 80 to 95 cm. long, very dark green with indistinct, light green streaks, often slightly tinged with purple, conspicuously blackish at edge, white or greenish-white at base. Leaf blade: 35 to 45 cm. long, 25 to 30 cm. wide, 35 to 40 cm. from tip to base of sinus, narrowly sagittate, conspicuously concave, horizontal, dark green; piko purple; lobes obtuse, overlapping, with narrow sinus. Inflorescence: Peduncle dark green with brown flecking at base; spathe 26 to 28 cm. long, the lower tubular portion 4 to 4.5 cm. long, dark green with purple at base and at constriction and sometimes along margins, the upper portion dark yellow; spadix 8.5 to 9 cm. long, the sterile appendage about 1 cm. long, orange as contrasted to the yellow staminate portion. 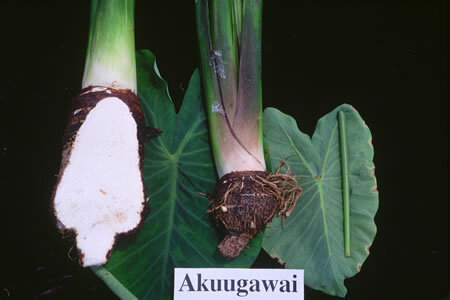 Origin, and derivation of name: Introduced from the South Seas by Wilder; the name Akuugawai, under which it was introduced, has been retained. Use: Good table taro but makes very poor poi. Remarks: The rank, erect habit of growth is similar to that of the Lauloa group.